West Auckland Town salvaged a draw deep into stoppage time, despite looking dead on their feet, forcing a replay on Tuesday night after Hednesford Town recovered from a goal down to lead 2-1 during a superb second half in an often fraught and tempestuous FA Cup Third Qualifying Round match. Played in wet and windy conditions for most of the game and with both sets of supporters suitably vocal in encouragement of their respective teams, a flurry of bookings early on played into the hands of the away side as the a rhythm to the game was prevented by regular stoppages for fouls, injuries and discussions with both captains. 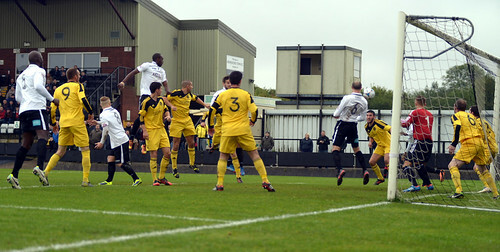 The home side had chance after chance throughout the game, Ben Bailey was inches away from connecting with a header across goal on eight minutes, Elliott Durrell curled a free kick which was superbly tipped wide by Jordan Nixon and, from the resulting corner, Bailey and Francino Francis failed to score within the scramble of players, hitting the post, the bar and having a shot cleared off the line. After Neil Harvey rounded the goalkeeper and saw his effort desperately cleared off the line on the stroke of half time, Nixon continued his inspired form in West Auckland’s goal by saving brilliantly from Wayne Riley just after the break but then, out of nowhere, Robert Briggs’s thunderbolt gave the underdogs a surprise lead on 50 minutes. The West Auckland player found space on the right wing and, perhaps understandably considering the distance from goal, was allowed to shoot by The Pitmen defence, only for him to catch the ball perfectly and beat Dan Crane all ends up. Ben Bailey twice hit the cross bar as The Pitmen pushed hard for an equaliser and their goal finally came from substitute Nathan Woolfe on 70 minutes as his header bobbled beyond the attempts to clear the ball off the line. 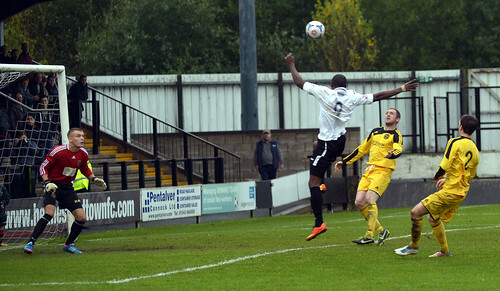 The equaliser knocked the stuffing out of the away side and Hednesford’s second goal came from an outstanding piece of play by Durrell. The top-scorer showed he can also do a handy line in assists as he picked the ball up on the right hand touchline and sent in a raking cross which Neil Harvey superbly headed back over Nixon’s head to give the home side the lead on 77 minutes. 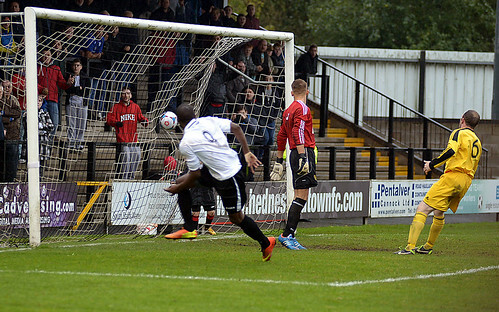 That goal looked to have put Hednesford through and Harvey could have settled the game, lashing wide when through on goal but, despite West Auckland’s resistance seemingly broken, they raised one final effort and the away support went crazy as Lewis Gaplin swept past Dan Crane at the death. 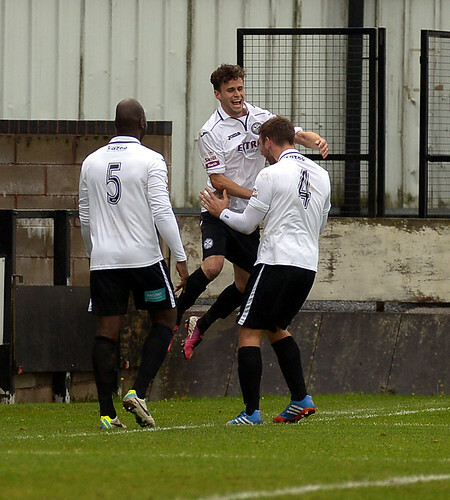 Hednesford now face a gruelling 340 mile round trip on Tuesday night to County Durham as they look to reach the Fourth Qualifying Round. However, but for the drama of the FA Cup, they could have won this game by a country mile.